The Late Triassic of southern Poland was home to a giant “mammal-like” reptile the size of an elephant and weighing some 9 tons. Scientists from the Polish Academy of Sciences in collaboration with colleagues from Uppsala University (Sweden), have published details on the discovery of the fossilised remains of a huge therapsid, specifically a dicynodont, that has been named Lisowicia bojani. This super-sized, distant ancestor of modern mammals is believed to have measured around 4. 5 metres in length and stood more than 2.6 metres tall. A life reconstruction of the giant dicynodont Lisowicia bojani. The first fossil remains were found by Polish geologists Robert Borzęcki and Piotr Menducki in 2005, when they were exploring a clay pit which represented a river deposit from the Upper Triassic. The dig site is close to the village of Lisowice, numerous field teams have been despatched to the area and over the last few years, more than 1,000 bones and bone fragments have been collected, including the fossilised remains of a giant dicynodont. At first the scientists thought they had discovered the fossils of a Sauropod, but soon it was realised that the large and robust bones represented a therapsid. The genus name is in honour of the nearby village, whilst the trivial name honours the German comparative anatomist Ludwig Heinrich Bojanus. Field team members working in the clay pit looking for dicynodont fossils. Dicynodonts (die-sigh-no-donts), are a group of extinct, synapsids which evolved during the Permian period. 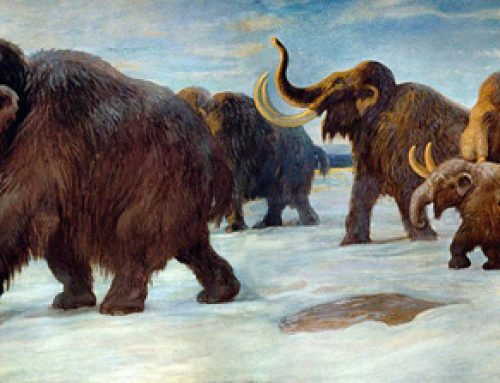 These quadrupeds were herbivorous and belong to the Order Therapsida, which includes modern mammals. It had been thought that by the Late Triassic, these animals had died out, the discovery of L. bojani from strata estimated to be around 210-205 million years old indicates that they persisted into the Late Triassic in Europe. The fossilised remains of Lisowicia are at least ten million years younger than any previously described dicynodont fossil material. The huge fossil limb bones of Lisowicia. The large bone above the compass is a humerus (upper arm bone), the bone by the feet is a scapula. The discovery of Lisowicia provides the first evidence that mammal-like elephant sized dicynodonts were present at the same time as the more well-known long-necked Sauropodomorpha dinosaurs, contrary to previous belief. Lisowicia fills a gap in the fossil record of dicynodonts and it shows that some anatomical features of limbs thought to characterize large mammals or dinosaurs evolved also in the non-mammalian synapsid. Furthermore, these findings from Poland are the first substantial finds of dicynodonts from the Late Triassic in Europe. Lisowicia is at least 40% bigger than any known dicynodont. Skeletal drawing of Lisowicia bojani. Note the scale bar = 1 metre.